No more expensive pullups or wet beds....The SleepDry alarm can actually save you money! more picsNow comes with 4 new long- life batteries included. The SleepDry System is made to be used in consultation with a physician. Pull-ups is a registered trademark of Kimberly Clark Corp.
Enuresis is the medical term for bedwetting. You really can help your child Stop Bedwetting is a trademark of Starchild/Labs. SleepDry is a trademark of StarChild/Labs. © Copyright Starchild/Labs. 2009. 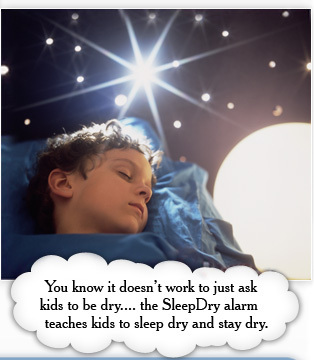 SleepDry is a Trademark of Starchild/Labs. Allrights reserved including design, content, look and feel.